Much discussion of this spring’s Planet under Pressure conference, which sought to “provide scientific leadership” in the run-up to Rio+20, was dominated by the brouhaha over planetary boundaries. But I recently caught a more interesting piece: a post-conference article by The Open University systems professor Ray Ison, who — in his commentary on the conference declaration — offers insight on the practice of science in the Anthropocene. There is a lack of reflexivity on the part of scientists themselves. Multiple perspectives including social scientists are needed to frame the research questions and agendas; more than lip-service needs to be paid to inter and trans-disciplinary research approaches (there is a need for significant institutional reform); the linear knowledge transfer paradigm needs to be abandoned in favour of knowledge co-production. There is a need for more conceptual rigour – sustainability is not a state but an ongoing process; targets distort practice and produce perverse outcomes; the language of ‘solutions’ is inadequate in terms of the nature of the situations that have to be dealt with and implies science can deliver panaceas – this is not the case. The need for systemic understanding and practice was highlighted throughout the conference but too often this was confused with systematic (see, for example, this explanation) and also too often people’s comments and framings suggested a lack of systemic sensibility (contextual and relational thinking and practice). We need to abandon triple bottom line approaches and framing and state clearly that the economic is merely one aspect of being social – and a domain where innovation has to happen. We live in a time of flux, a time for innovation and transformation -- a time for getting good at change. 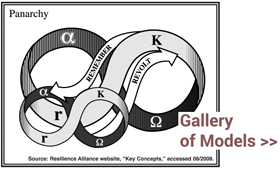 With this blog, I focus on theories of change, the search for affordances, practices of engagement, and ways of learning. Call that: solving for pattern.